George Leinonen photo Hancock’s Brendan LeClaire tackles Lake Linden-Hubbell’s James Tuovila, Aug. 26, 2017, at Warner Field in Lake Linden. With three weeks of the regular season remaining, the Copper Country could possibly end up with as many as four 11-person football teams reaching the postseason — in addition to the Ontonagon Gladiators in eight-person football. Here is a rundown of where each local team currently stands. Barring an upset of massive proportions by the Gwinn Modeltowners (2-4), the Hancock Bulldogs will clinch a playoff berth Friday. Gwinn’s only two wins came against the Iron Mountain Mountaineers (1-5) and Manistique Emeralds (0-6), and Iron Mountain’s lone win came against Manistique, so there’s that. Plus, you take away Gwinn’s two wins and they’ve been outscored 119-12. That point differential is poised to get worse against a Hancock team that is rolling on offense. The Bulldogs have averaged 37.5 points this season, and the no-huddle, uptempo attack is at its peak right now. Hancock scored on its first six possessions in the 56-20 win over the Hurley Midgets on Friday, and a three-and-out to start the second half was the only drive when the first-team offense didn’t score. So how do you improve on that? Out of Hancock’s co-op with Chassell, Jeffers and Dollar Bay, the Bulldogs have received numerous playmakers from each school. Not including Hancock’s 48-20 win over Northland Pines, Chassell’s Aaron Barnes has ran for 428 yards and eight touchdowns, while Grant Hokenson — another Chassell athlete — has caught 17 passes for 292 yards and three scores. Defensively, Jeffers’ Carson Turner is a stout, heavy-hitting versatile defender who can play linebacker or end. 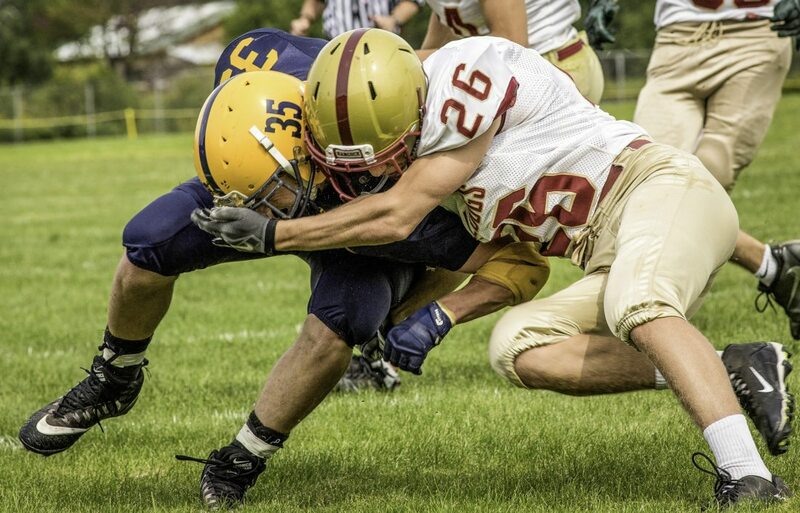 The Bulldogs received just one player from Dollar Bay in the co-op, but Brendan LeClaire has turned out to be the top safety in the area. LeClaire adds tremendous run support with his quick pursuit angles to go along with his sure-handed tackling. Hancock also found out he’s a solid runner, as LeClaire went 58 yards untouched for a touchdown against Hurley. Hancock is projected to travel to the Kingsford Flivvers (4-1) in the opening round of the Division 5 district, with the Gladstone Braves (6-0) facing the Menominee Maroons (4-2) in the other district semifinal. I have no reason to think that projection won’t hold up — it’s likely the most predictable. Also, the Twitterverse thinks Hancock has no chance in that district, so do with that as you please. L’Anse finds itself in a weird spot. After pulling off consecutive upsets over Hancock (20-18) and Hurley (20-18), the Purple Hornets lost a head-scratcher to the 2-4 Gogebic Miners, 26-7. The injury to Logan Fish –L’Anse’s top receiver and starting defensive back — didn’t help them, but the running game with Foster Miller, who gained 445 yards against Hancock and Hurley, figured to be enough to top the Miners. But Miller was held to 105 yards on 26 carries, and L’Anse had no answer for Gogebic’s Wing-T attack. Now, the Purple Hornets will have to regroup with a desperate Calumet (3-3) team coming to L’Anse on Friday. The loser will likely be left outside the playoffs, depending if either team gets enough playoff points to qualify with five wins — six wins guarantees a playoff berth in a nine-game season, while five solidifies a berth in an eight-game season. The Purple Hornets are currently projected as the third seed in Division 7 and would have a rematch with the Westwood Patriots, who defeated L’Anse 32-10 in Week 2. Elk Rapids and Oscoda make up the other district semifinal. L’Anse closes the year with a trip to Northland Pines (1-6) and a visit to West Iron County (5-1). The preseason West-PAC favorite must now win out to guarantee a playoff berth. That means a win Friday against L’Anse, a win the following week at home against Gogebic and a win at home versus undefeated Gladstone (6-0). Calumet’s inability to dominate the line of scrimmage has been the biggest difference from the last two Calumet teams that captured West-PAC titles. When Calumet went 13-0 against West-PAC foes the past two seasons, the Copper Kings made their mark on running downhill and physically dominating teams. They haven’t been able to do that to the same degree this year, forcing Calumet to rely on the play-making skills of Brent Loukus in the option game. Defensively, it’s been a similar tale at the line of scrimmage. Calumet allowed 295 yards rushing to Hurley in the Midgets’ 32-26 win, while Hancock racked up 260 yards on the ground in its 42-24 victory over Calumet. If Calumet is able to turn its season around, it will have to start upfront. The Lakes recorded one of the strangest wins, 24-12, over the Bark River-Harris Broncos (3-3) on Saturday. I spoke with someone from LL-H who was at the game, and once the Lakes fell down 12-0, they worried about the possibility of a running clock (trailing by 35) being enforced against them. Instead, LL-H scored 24 unanswered points despite running only 27 plays to BR-H’s 79. Quality over quantity. The Lakes scored on a 50-yard run from James Tuovila, an interception returned for a touchdown by Kellen Klein and a 26-yard pass from Carter Crouch to Dominic Wagner. Add on the 2-point conversions in each instance, and that’s how you outscore a team that ran nearly three times more plays than you. Now, after starting 0-3, LL-H has a legitimate chance at making the postseason. Heck, the Lakes could even capture the conference title if they win out, which would include a victory at the Norway Knights (6-0, 3-0) on Oct. 13. LL-H faces an improved Houghton Gremlins team on Saturday. Following the Norway showdown, LL-H wraps up the season with Manistique. I’ve seen bad football teams — and even good ones — start to care less this time of the season. Numerous times, I’ve heard athletes say, “I just want basketball to start.” Up here, you can obviously switch out “basketball” for “hockey,” too. However, that’s apparently not the case at Houghton. After starting the season 0-5 and with nothing to play for but pride, the Gremlins recorded a 32-0 victory over Northland Pines on Friday. That’s a credit to the players and coaches for sticking with the program throughout the entire season and completely buying in when others may expect you to lose interest at this point. It’s that type of commitment that can lay the foundation for the future success of the program under first-year head coach Frank Bonacrosi. The Gladiators — similar to the Bulldogs — appear to be heavy favorites to make the postseason. Ontonagon goes to Brimley on Saturday to face Bear Lake (2-4) before hosting the Forest Park Trojans (4-2). But if the Gladiators fall to the Trojans, a win over Bear Lake and the 2-4 Carney Nadeau Wolves would secure a playoff berth. The Gladiators are projected to be placed as the third seed in their district and would travel to face the Rudyard Bulldogs (5-1). In the other semifinal, the Stephenson Eagles (6-0) would play host to the Brimley Bays (3-3). The Eagles are ranked No. 1 in the state and are coming off a 56-14 win over Ontonagon on Friday. In that contest, Jake Witt scored both of Ontonagon’s touchdowns with a 33-yard reception and a 16-yard catch. But Witt, who set state records last season with 71 catches for 1,698 yards and 25 touchdowns, was targeted only one other time in the game. At 6-foot-7 and built like he’s ready to play defensive end at Michigan Tech, Witt is the biggest mismatch in eight-person football. No kid through the ages of 16-18 is able to match up with him on the outside; I would throw him the ball on a fly route every time until he became too tired and asked to come out. Not throwing him the ball is the equivalent to buying a new Ferrari and keeping the car locked up in storage forever and never driving it.